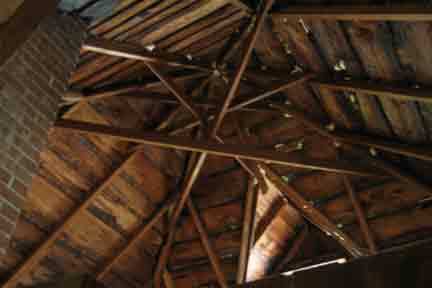 The original cabin at St. Helena became infested with bats and no amount of persuasion could get them to consider other accommodations. 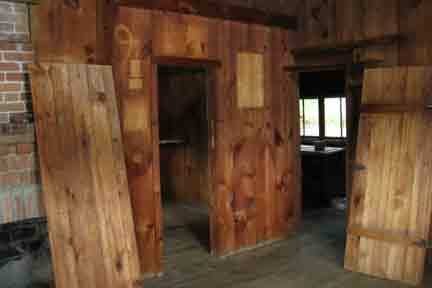 You can see, from the picture on the right, why the bats were reluctant to leave. 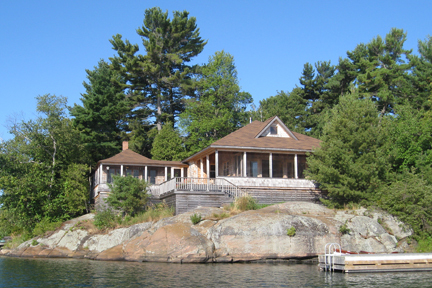 The decision was made in 2008 to tear the cabin down and build a new cottage. I was commissioned by one of the current residents of St. Helena to make some pieces from wood from this 106 year old cabin. With all the nails removed, the wood was transported by boat to Pointe au Baril Station on the mainland and then to my studio in the Mulmur Hills. 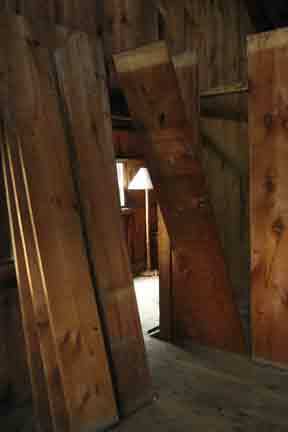 The wood was rough-sawed pine with some planks being up to 15 inches wide. 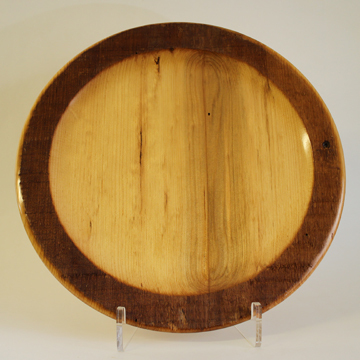 The wood had a deep, rich honey colour to it, imparted by over a century of morning sunshine. 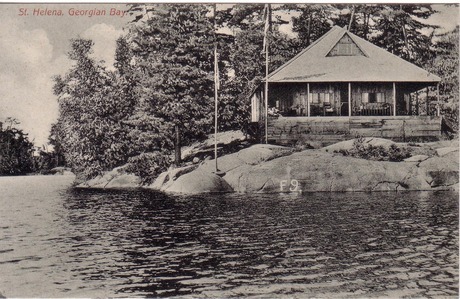 The wood was probably local as there was extensive lumbering along the shores of Georgian Bay since the early 1800's. 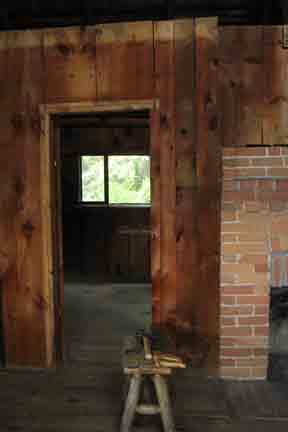 Although the best woods had been cut long before this cabin was built, the rough-sawed timber used for these cottages was still readily available. I fulfilled the requirements of the commission and still had plenty of wood left over. 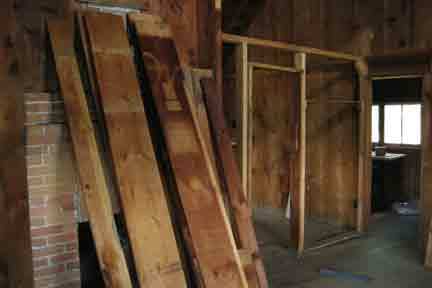 My customer graciously consented to my request to use some of this wood for the "History in the Making" project. I made a set of 4 chargers from the small pieces that I had removed from above the doors. 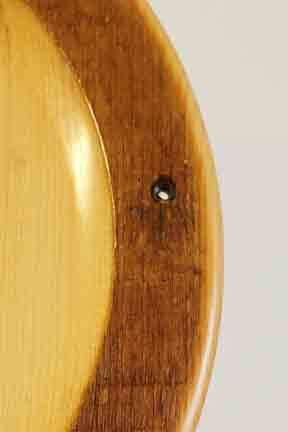 Notice the rich patina of the pine and the original surface that I have left on the rim. St. Helena's story is told on the bottoms of these chargers with a part of the story on each one. The chargers are: "The Early Days", "Helen Davis", "The Islands of Pointe au Baril" and "St. Helena". 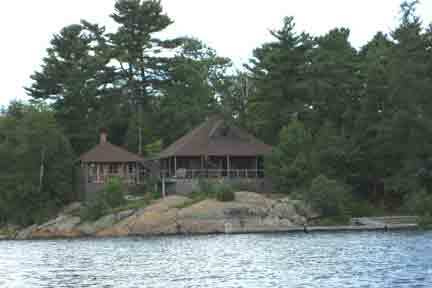 Travelling up the shore of Georgian Bay from the Midland area, one can paddle, sail or motor through protected channels, for the most part, to the Pointe au Baril area. After passing the Pointe au Baril lighthouse one must travel through open water to reach any of the rest of the communities on the northern Georgian Bay shore. Before the lighthouse, built in 1889, a barrel with a lantern on top was placed on the rocks at the northern entrance to the area and this was used to guide boats into the channel after dark and during storms. 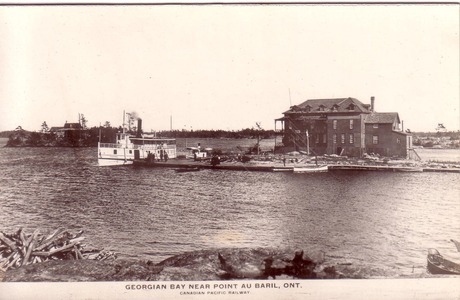 The "barrel on the point" was the English translation of the French "Pointe au Baril" and this became the name for the area. 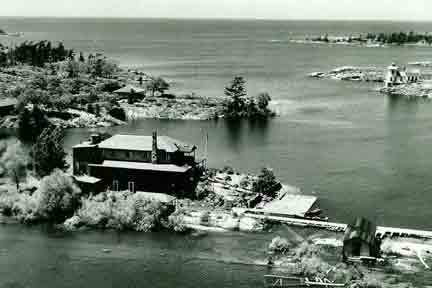 Our story about St. Helena begins with a visitor to the Bellevue Hotel which is near the Pointe au Baril lighthouse. The Hotel started in 1900 and was part of a group of buildings that included the lighthouse and the fishing stations. From there one could look out past the lighthouse to the open waters of Georgian Bay. It was the summer of 1902 when Helen Davis and her friends the H.T. Moshers left their home town of Rochester, New York, with the intent to explore the northern lakes. 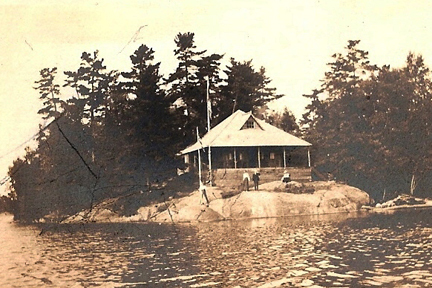 They found themselves travelling by steamer up the shore of Georgian Bay and were fascinated by the many islands along the way. They stopped and spent some time at the Bellevue Hotel. From this base they rowed among the islands. On one of these excursions they chanced upon a surveyor who was cataloging the islands for the British Crown. During their conversation with him, they found that an island of an acre or two could be bought for $5 or $10. Their excursion to the northern lakes stopped here as both Helen and the Moshers bought islands. The story spreads out a bit from here with Helen's sister Katharine buying an island near by and her brother Hamilton, seeing the potential for another hotel, built The Ojibway in 1906. We are going to leave the siblings to their own devices and paddle a little further with Helen. 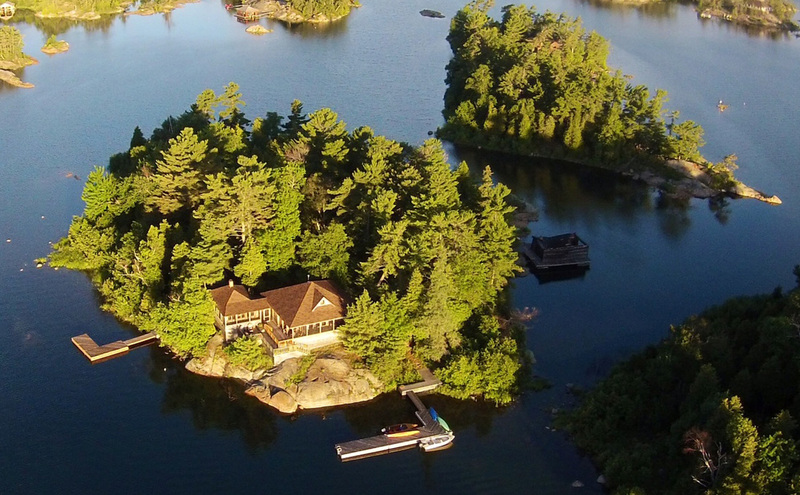 The island was given, by Helen, to her niece, Frances and has continued in the family through several generations. The wall on the left side of the fireplace. The wall on the right side of the fireplace. Charger detail showing the rough surface. The original cottage, on the right, in 2008 just before it was taken down. Starting to remove the wood from the wall on the left side of the fireplace. The wall removed from the right side of the fireplace. The new cottage in 2013. St. Helena, Summer, 2014. Photograph by John S. Pepper.